We all know the saying that "time is money". If you believe this, than you are richer and have more to invest than you think. Our story about making money on the web is all about you becoming successful with no capital investment. Instead, you will be investing "time" money. The great thing is, this type of investment is far better than any banknote, because you will be investing with your heart and passion, into your goals and dreams. If you are wondering how to become rich, you must first get out of your head the words "get rich quick". There is no such thing. When we talk about get rich quick, we mean 2 to 5 years. In the business world, that is fast. It doesn't come easy either. You must be prepared to make some sacrifices to make money internet style. Putting a website together and making money on the internet doesn't just magically happen for anyone. We don't want to discourage anyone, we just want to state the most basic facts up front so you don't read this article in hopes of finding some magical formula. So let's continue. Many people wanted to know how we put our website together, and how we achieved some success in such a short time. So, we thought it was time to share our story. Over the years, we had both attended, watched, or read about sales and motivational speakers always claiming that they had found the “secret”, or the “key” to success or how to be wealthy. So we talked about, what is the secret? What is the “key”? 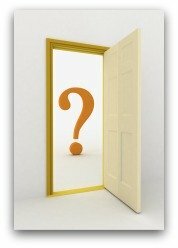 What doors does the key open? We do believe in keys and doors. 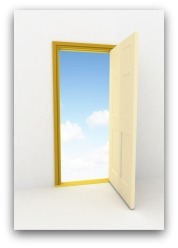 We believe there is one great outer door that opens up to an infinite number of inner doors. There are no keys needed for the inner doors, because they are not locked. You only need the key to the outer door. Which brings us back to the “key”. The key is not made of metal, but your attitude. It is forged from your enthusiasm and self confidence. Your attitude is what will align yourhopes, dreams, and goals (grooves in the key), to the tumblers in the lock. Once this happens you just have to turn the key, open the door, and a whole new world will open for you. You will view everything in a different light the moment you walk through that door. Once inside, you can open any other door you like. For us, that door was Site Build It. I had some good jobs, but nothing that fulfilled my life except for landscaping. I loved it, and the feeling you get from transforming someone's yard. The look on their faces would always say it all. The only problem was, it was a very seasonal business living in a northern climate. I felt I was destined for something more, something great, and something that I could put my heart and soul into. I wanted a chance to change some things in my past, and also wanted to give back and help others in some way. The idea to build a site based around Landscaping came from my studies. I would spend many hours researching on how to learn more about my line of work. How to offer more, build more, find good ideas to use, and understand all the products available to me. I couldn't find one good site that would bring me all that. I would frequently find good articles, and occasionally good how-to's, but never all at the same place. So we decided to build it. I had the skills to push, promote, and market it. (I love doing that sort of work.) I had the drive, enthusiasm, initiative, ambition and self confidence to succeed. I always knew I had the key, I just needed the door. Ok, enough of me. Let's hear from the other half of the Dream-yard team. For me, my first go round, I had the door, but no key. My journey actually started in 2006. I had a great job, but I had hit the proverbial glass ceiling, there was nowhere else for me to go within my organization or within my field. I wanted to (needed to) make a change. Some people actually view this change as radical, calling it selfish, silly, or irresponsible. I prefer courageous, inspired, living a life of choice! After all, there is nothing worse than not being happy with your job. You infect yourself and everyone around you with unhappiness. I am sure we all know someone in this boat. Since I am not selfish, silly or irresponsible, I spent hours researching different options. There were a lot of GRQ (Get Rich Quick) schemes out there. I admit, I looked and pondered, but something about them didn’t sit right with me. I wanted to have flexibility and options in my life, but I still wanted to feel good about the person in the mirror looking back at me. So I developed some criteria, and used it as the measure of all the opportunities I considered. Freedom - From schedules, rush hour traffic, the alarm. Mobility - To be able to do my work and passion from anywhere, at any time. “NO” - No overhead, no inventory, no boss, no employees, no capital investment. Accountability - To myself and my son, with our life as the priority (not having our life shuffled down the list getting trumped by work obligations). Passive Income - By passive, I meant that I was willing to do the work to put things in place to earn an income. However, I didn’t want the income dependant on my sitting in a particular cubicle for a certain span of time each day. I wanted a source of income that kept working, while I was sleeping, or playing with my son, or just about anything you can name. I wanted it to be of value to people - many people, not just myself. After looking at countless options, I discovered that Site Build It was the only site that fit ALL my criteria. Actually, it was a course I read called Affiliate Masters, and it made so much sense to me. From that information, I learned about SBI, including Elad's amazing story. (You should see it now). I knew I had found the “door”. Unfortunately, I let a whole series of events in my life take away my enthusiasm and self confidance. My attitude was destroyed, and the key along with it. I never opened the door. Believe me, once SBI is in your head, it never leaves. It remains the answer to all the “if-only’s”, “I wishes”, “maybe next year we could”...thoughts you’ll ever have. I stuck with my day job a few more years. Then, eventually, I went back to school. I remember watching a superman movie a few years ago. I don’t remember which one it was, but I do remember Richard Pryor playing a lousy employee hacking the company payroll. (This is not my model of choice, but it puts things into perspective.) The idea that a few cents from many different sources can contribute to a pretty significant source of income was brilliant to me. (ie: legitimate use of the internet with (Google Adsense). SBI can also show you the different sources and how many pennies. This was fantastic information. The other important part I explained was SBI’s mantra, follow the tortoise. Don't rush, build it properly and use the action guides. (Slow and steady wins the race.) To quote another movie...”If you build it, they will come.” (Thank you Field of Dreams). Another regurgitated saying, "People don't plan to fail, they fail to plan"
I think it should be more like this, "Often people plan and overthink themselves out of some great opportunities"
How many ideas, inventions, businesses do you think have never made it off the ground because of this? Over-planning and over-analyzing, probably prevent more people from being successful than anything. YES, we agree that business plans are needed when applying for a loan. What we are saying, is that more ideas and businesses that would be successful are ditched because of this. Too much negativity can kill the enthusiasm. When this happens, you are dead. Sometimes you just have to do it. What is the best way to learn? Immersion. Here is how we immersed ourselves. We bought it. Yes, that's it. Pretty simple, right? We had everything we needed now, and the key worked perfectly as we put it in the lock and turned it. We then opened the door and walked through it together. We purchased SBI on my birthday in December. (What an amazing gift!) We spent our free time in the winter researching, writing, editing and learning all about SBI. We registered our domain name in February, and started pubishing our material in the spring of 2011. We really learned a lot as we went. We thought that we would have all our pre-written material published before we let people know we were here. THEN we would continue with all our content building. BUT, SBI worked so well, people found us before we were ready. We had page one Google rankings for some of our keywords within a few weeks (WOW), which meant we had traffic from seven countries already (and we thought we were the only ones who knew about us!) we now get traffic from over 100 countries a month on a steady basis. We thought this whole thing was just so cool. How was it possible to rank in the top 2% of sites on the net in just a few short months? SBI of course. And yes, we kept a great big board on our wall with these statistics. We tracked anything that was a good motivator, or measure of our success right from day one. Our journey has been a lot of fun, meeting some pretty amazing people and fellow website owners. I was pretty fortunate to talk on the phone with Ben (The owner of Pinterest), when his site had an Alexa traffic rank of around 500,000. 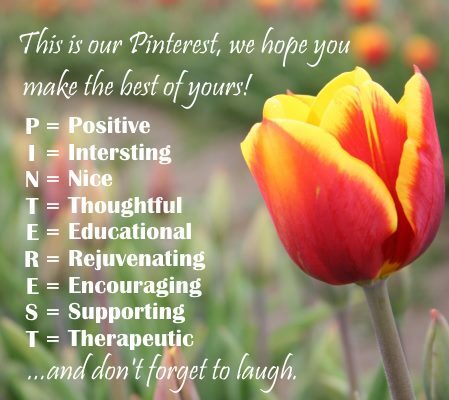 That was sometime around August of 2011 just before we joined Pinterest. Now look where they are. Ben was a genuine, polite, decent, and respectable person to talk to, and his success is inspirational enough for anyone. 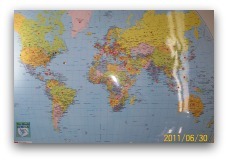 World map in Dream-yard's office showing all the countries we have traffic from. Every day, we are a step closer to living our dreams. We still have the day jobs, I still go to school, and our home life is our priority. After all that, the site gets what we have left over. Every hour that we spend on Dream-yard makes a difference. We gave each other high fives when we made ‘our first 50 cents’...but that turned into $5 then $50 very quickly. The growth is exponential and we can’t wait to see where the next year takes us. It has been an amazing journey so far. Every day is like Christmas. We were never morning people, now we are up every day between 3 and 6 to open our presents. (Our daily traffic statistics.) Yep, it's pretty exciting. We love Solo Build It and wish everyone could have the chance to create the life of their dreams. The good news is everyone can. As creator of Solo Build It, Dr. Ken Evoy says, "All you need is BAM...Brains and Motivation." Remember... “You” already have the key. Are you ready to open the door?